With the aim to comparatively investigate the effect of the addition of additives such as biochar (BC), microbial inoculation (MI) and biochar/microbial inoculation (BCMI) on composting enhancement, nitrogen conservation, greenhouse gas emissions, the quality improvement of pig manure compost were comparatively investigated in a 42-day aerobic pig manure composting experiment. 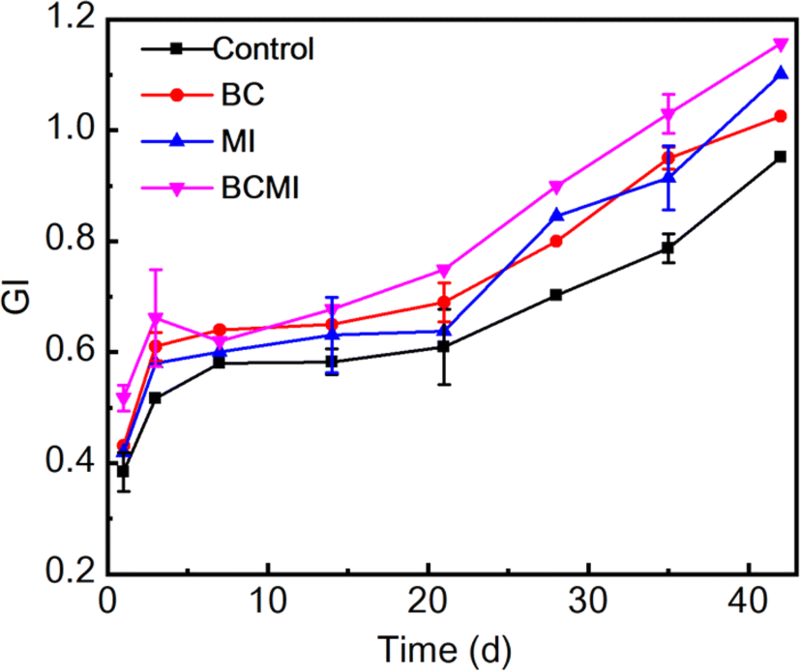 The results showed that the duration of the thermophilic stage, the degradation of organic matter and the detoxification of the compost were enhanced in the BC, MI and BCMI treatments compared with those in the control (without additive). Moreover, the content of total Kjeldahl nitrogen in the BC, MI and BCMI treatments was increased by 38.1, 48.9 and 59.0%, respectively, through the reduction of NH3 volatilization and N2O production, which were higher than those of the control (31.8%). A reduction in CH4 release during composting was not observed with the MI and BCMI treatments. Following 42 days of composting, the final product of the three treatments exhibited acceptable potential for use as a fertilizer in agriculture; the BCMI treatment showed an especially synergistic effect on pig manure composting enhancement. The increase in pig breeding in China has led to a large amount of fresh pig manure (PM) produced (> 490 million tons) each year (NBSC 2016). PM must be disposed of suitably, or it can result in many environmental problems, such as soil and water pollution as well as odor and greenhouse gas emissions (Kafle and Sang 2013). Composting is one of the promising bioconversion methods for the recycling of manure waste, and it turns organic waste into valuable soil conditioner or fertilizer (Bernal et al. 2009). However, the traditional static windrow/pile composting process generates ammonia volatilization, significant nitrogen loss and the emission of greenhouse gases (mainly CH4 and N2O) (Awasthi et al. 2016a), thus leading to a lower agronomic value of end compost products and serious secondary environmental problems (Yang et al. 2015). Therefore, optimizing the composting procedure is necessary to enhance composting efficiency (Chen et al. 2010). It is undeniable that the optimization of the composting process can be achieved through effective design and control of the conditions and environmental parameters underlying the composting process (Xiao et al. 2017). Accordingly, numerous researchers have delved into the optimization of the composting process, and as a result, many relevant strategies for effective composting operations have been addressed, such as aeration rate regulation (Chowdhury et al. 2014), carbon/nitrogen (C/N) ratio optimization (Huang et al. 2004) and moisture content adjustment (Chew et al. 2018). Recently, researchers reported that employing additives during composting provided benefits on solving these problems. For instance, additives such as zeolite, medical stone, and phosphogypsum effectively reduced the volatilization of NH3, CH4 and N2O, respectively, during biosolid and food waste composting (Awasthi et al. 2016a, b; Wang et al. 2017; Yuan et al. 2018). In addition, biochar, as the eco-friendly porous solid product of biomass thermal treatment (Li et al. 2018), was believed to have great potential for composting applications, including in the reduction of NH3 volatilization and the improvement of the agricultural value of compost product (Steiner et al. 2010; Wei et al. 2017; Malinowski et al. 2019). For example, Liu et al. (2017b) discovered that the addition of biochar reduced NH3 volatilization by 22.4% and enhanced nitrate-nitrogen accumulation by 310.6% during sludge composting. It is known that microbes play essential roles in the composting system. Many researchers have pointed out that indigenous microbes and/or additional inoculation improved the composting process, especially with the introduction of exogenous complex microorganism inoculums into the composting materials (Xi et al. 2012; Wei et al. 2019). For example, the intricate microorganism inoculation containing Lactobacillus buchneri, Candida rugopelliculosa and Bacillus casei reduced nitrogen loss during municipal solid waste composting (Wei et al. 2007), and the intricate microorganism inoculation containing Ammonia-oxidizing, Nitrobacter, Thiobacillus, and Fungi improved the efficiency and increased the quality of municipal solid wastes (Xi et al. 2012). In addition, the integrated use of additives was considered more effective for composting improvement than the utilization of a simple additive. For instance, up to 95% of CH4 and 97% of N2O volatilization were reduced by the combined application of zeolite and biochar during biosolid composting, respectively; these values were higher than those of single biochar or zeolite addition (Awasthi et al. 2016a). As a consequence, Mao et al. (2018) directly mixed bamboo biochar (5% in dry weight, DW) and commercial bacterial powder (0.3% in DW) during PM composting and demonstrated that the combined use of biochar and bacterial inoculum powder could reduce 69% of CH4 emissions, 45% of N2O emissions and 26% of NH3 emissions. Simply adding the combination of biochar and bacterial powder into the compost mixture obviously improved the nitrogen conservation. Biochar is an efficient ammonia adsorbent in composting (Steiner et al. 2010); it is also considered to be a porous biocompatible material that benefits microorganism propagation and inhabitation and thus an increase in microbial population and activity (Kolton et al. 2016). Based on this view, some biochar/microbial inoculation powders or biochar-loaded commercial microbial inoculation (BCMI) had been produced in the market with the development of biochar technology. Moreover, in the perspective of engineering practice and microbial inoculation storage, the BCMI powder produced by direct spraying the concentrated MI fluid onto the porous BC solid substrate during its manufacture is beneficial for the storage, transportation and utilization of microbial inoculation in practice. Therefore, it's inspired to investigate the effect of the amendment commercial biochar/microbial inoculation (BCMI) on composting enhancement, which could promote the biochar technology as well as potential of BCMI utilization in organic waste composting conversion. However, until now, the role of BCMI in nitrogen conservation and quality improvement in pig manure composting remained unclear. Therefore, this study highlights the effect of BCMI as a compost additive to PM compost on nitrogen conservation, quality improvement and greenhouse gas emissions, with the further purpose of exploring more effective additives for PM composting. Fresh PM was gathered from the hog lot of the 3rd Farm Test Station of Northwest A&F University. Dry sawdust (SD) was purchased from the local market. Biochar (BC), derived from pyrolyzing of bamboo at 450‒500 °C (with particle size of less than 2 mm), was obtained from Shenlonggu Carbon Materials Co. Ltd., Lishui, China. The commercial microbial inoculant (MI) fluid was provided by Jinyuanyang Biological Technology Co. Ltd., Jiangmen, China; the concentrated MI product was described as facultative intricate microorganisms with both aerobic and anaerobic microbial communities (mainly Lactobacillus, Flavobacterium, Candida, Bacillus, Actinomadura, Solibacillus, and Psychrobacter, etc.). The average value of living bacteria count in the concentrated MI fluid was approximately 2 × 1013 CFU/g. The BCMI powder was produced by direct spraying of the MI fluid onto the porous BC substrate during its manufacture for the convenience of storage and transportation. The level of inoculation strains was above 1 × 108 CFU/g. The selected physico-chemical parameters of the compost raw materials are listed in Table 1. All these raw materials were used as received. Approximately 10 kg PM (in DW) and 5 kg SD were mixed manually. The mixture was further adjusted to a moisture content of ~ 60% and a C/N ratio of ~ 30 prior to the addition of BC, MI and BCMI. For convenience, the compost without additive was labeled as the control. The treatments with added BC (0.5%, in weight), MI (0.05%, in weight) and BCMI (in weight, equivalent to the spraying of 0.05% MI onto 0.5% BC before being naturally dried) are referred to as BC, MI and BCMI, respectively. After being fully mixed by hand, 40 kg of each treatment (~ 100 L) was put into an experimental composter (with a volume of ~ 130 L) and aerobically composted for a test period of 42 days per the procedure reported previously in the literature (Li et al. 2015). During the composting period, the compost mixture was mixed automatically two times. The temperature of the compost mixture was monitored two times every day (9:00 and 19:00) with the average temperature recorded. The ambient temperature was also documented at the same time. The samples were collected on days 1, 3, 7, 14, 21, 28, 35 and 42 following homogeneous mixing. The fresh sample was divided into two parts: one was stored at 4 °C, and the other was air-dried before analysis. The specific surface areas and average pore volumes of BC and BCMI were measured using a surface area meter (Micromeritics ASAP 2020) and a porosimetry analyzer (Norcross, GA). 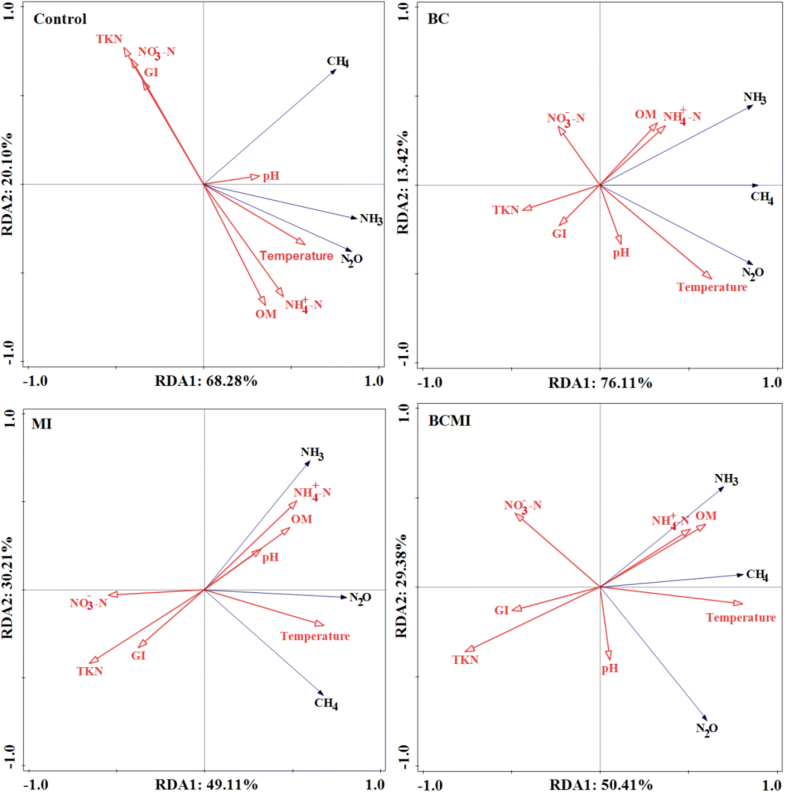 The oxygenated acidic surface groups, including carboxyl, lactonic and phenolic groups of BC and BCMI were analyzed using the Boehm titration method (Wang et al. 2013). The pH, organic matter (OM), ammonium nitrogen (NH4+-N), nitrate nitrogen (NO3−–N) and total Kjeldahl nitrogen (TKN) contents were determined by methods suggested by Li et al. (2015). The seed germination index (GI) was analyzed per the previous study by using potherb mustard seed as an indicative plant (Li et al. 2012). The NH3, CH4 and N2O samples were collected every morning for the first 2 weeks and once every other day for the remainder of the test period. The NH3 was absorbed in boric-acid and titrated by standard sulfuric acid (Meeker and Wagner 1993). The CH4 and N2O emissions were measured with an Agilent 6890 N gas chromatography system (Agilent Technologies, United States) according to previous literature (Ren et al. 2018). All measurement indicators were repeated three times. Statistical analysis was performed by SPSS 19.0 software (IMB Corporation, USA) in T- test with a probability defined at 0.05. The redundancy analysis (RDA) was employed to analyze the relationship among TKN, NH4+–N, NO3−–N, NH3, CH4, N2O and other parameters with the help of Canoco 5 program. Temperature is an important indicator of microbial activities in compost. The change in compost temperature is depicted in Fig. 1a. At the beginning of composting, the temperature of the compost heap increased quickly, entering the thermophilic phase (over 55 °C), with the peak temperature reaching 60.7 (day 4), 73.8 (day 5), 63.9 (day 8) and 62.6 °C (day 9) in the control, BC, MI and BCMI treatments, respectively. In addition, the thermophilic stage was maintained for a period of 6, 11, 10 and 12 days for the control, BC, MI and BCMI treatments, respectively, which was long enough to eliminate pathogens in the compost. It is clear that the use of additives such as biochar and microbial inoculations in a compost mixture improves the rapid temperature increase and prolongs the duration of the thermophilic phase of composting, thus indicating the benefit of additives to the sanitation of the compost mixture (Jouraiphy et al. 2005). The result was in line with previous results recorded during the composting of PM with the addition of corn stalk and bamboo biochar (Chen et al. 2010; Li et al. 2015). The initial values of pH in all treatments were in the range of 7.10–7.61, followed by a rapid increase to ≥ 8.12 within 3 days after the start of composting (Fig. 1b). The rapid increase in pH values in the initial stage was perhaps due to the rapid release of ammonia at high temperature (Wong et al. 2009). As composting proceeded, a slight decrease in the pH value was observed, possibly owing to the accumulation of low-molecular organic acids and CO2 during organic matter degradation (Li et al. 2012). After 42 days of composting, the pH values in all treatments were in the range of 8.05–8.30, which met the standard requirement (7.0‒8.5) (Masó and Blasi 2008). A similar pH variation was noticed by Jiang et al. (2015) in the composting of PM inoculated with commercial nitrogen turnover bacterial floc. The variation in OM in all compost treatments is displayed in Fig. 1c. The original OM content was 84.1‒84.5% in all treatments. The OM content in all treatments continuously declined with the progression of composting, which may be due to the degradation of carbohydrate matter by the microorganisms (Bernal et al. 2009; Zhao et al. 2018). After 42 days of composting, the OM content in all treatments decreased by 19.0, 21.4, 23.4 and 26.1% in the control, BC, MI and BCMI treatments, respectively. The reduction in OM content in the additive treatments was slightly enhanced during the 42-day composting period compared with that in the control. This result was in line with the observations mentioned by Du et al. (2019), Ning et al. (2017) and Sánchez-García et al. 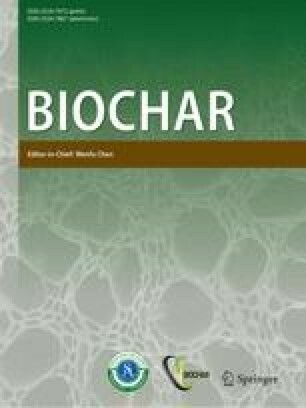 (2015) that biochar addition could enhance both the porosity of the compost substrate and the activity of the microbial community, thus supporting the aerobic microbial degradation of organic matter. NH3 emissions occurred mainly within the initial 2 weeks of the test period and then decreased irregularly in a fluctuating manner with the progression of composting (Fig. 2a). Peak NH3 emissions were attained within the first 4–6 days of composting, and these values were closely correlated with the variation in compost temperature (He et al. 2018) as shown in Fig. 1a. During the thermophilic phase, NH3 volatilization was due to the biodegradation of nitrogen-containing material and the high temperature (Yuan et al. 2015). The later decrease in NH3 emissions was probably related to the transformation of ammonia into ammonium and nitrate (Bernal et al. 1993). Throughout the 42-day composting period, the control showed the highest amount of cumulative NH3 emissions (8.01 g), followed by BC (6.46 g), MI (4.06 g) and BCMI (2.36 g). The cumulative NH3 emissions in additive treatments were lower than those of the control, indicating that additives such as biochar and microbial inoculant could reduce NH3 volatilization, which was likely due to the absorption of ammonia by the additives (Mao et al. 2018). For example, the biochar and the biochar/microbial inoculation powders used in the study are porous materials with lots of surface acidic functional groups in their structure. The previous analysis showed that the specific surface area, average pore volume and the concentration of total surface acidic functional groups of BC were 165.42 m2 g‒1, 0.163 cm3 g‒1 and 0.25 mmol g‒1 respectively, while, after spraying the MI fluid onto the porous BC substrate, the specific surface area, average pore volume and the concentration of total surface acidic functional groups of BCMI were 135.23 m2 g‒1, 0.129 cm3 g‒1 and 0.37 mmol g‒1, respectively. Moreover, the BC and MI treatment showed better effect on NH3 emission reduction than the control, and the effect would be further enhanced by treatment with BCMI, implying that biochar-loaded commercial microbial inoculation had a synergistic effect on nitrogen conservation through NH3 emission reduction during composting. During the 42-day composting period, the NH4+-N concentration increased initially, reaching a peak at the thermophilic stage and then decreasing gradually (Fig. 2b). This changing trend in NH4+–N concentration was consistent with the ammonia emission profile. The high content of NH4+–N in the thermophilic phase was due to the production of water-soluble NH3 during the degradation of nitrogen-containing material (Zhao et al. 2018). The later reduction in NH4+–N concentration was likely attributed to the ammonia volatilization as well as nitrification and denitrification by bacteria (Fukumoto et al. 2003). After 42 days of composting, the final NH4+–N concentrations of all treatments were approximately 0.11–0.13 g.kg‒1, implying the maturation of end products. The NO3−–N concentration in all treatments was maintained at a low level (≤ 0.39 g.kg‒1) at the beginning stage of composting, while it dramatically increased with the progression of composting (Fig. 2c). The low NO3−–N concentration of compost in the thermophilic phase might be due to the inhibiting effects of high temperature and ammonia on the activity and growth of nitrifying bacteria (Jiang et al. 2016). After 42 days of composting, the concentration of NO3−–N reached 0.82, 1.09, 1.20 and 1.23 g kg‒1in the control, BC, MI and BCMI treatments, respectively. The final NO3−–N concentrations in the BC, MI and BCMI treatments were higher than those in the control, suggesting that the existence of biochar and microbial floc in the compost mixture likely accelerated the activity and growth of nitrifying bacteria. The result was consistent with the observations mentioned in lime and biochar-added food waste composting (Wong et al. 2009) as well as chicken manure composting (Khan et al. 2014). The TKN content is a crucial parameter for the evaluation of compost quality. As revealed in Fig. 2d, the content of TKN in all treatments slightly declined at the beginning of composting and gradually increased afterwards. The initial decline in TKN content was related to the volatilization of NH3 in the thermophilic phase (Wang et al. 2016). The later increase in TKN content was possibly due to the enrichment of nitrogen-containing matter with the progression of composting (Li et al. 2012). A similar finding was also reported by Wang et al. (2017) during the aerobic composting of zeolite, Ca-bentonite and medical stone mineral-amended sewage sludge. After 42 days of composting, the final content of TKN in the control, BC, MI and BCMI treatments increased by 31.8, 38.1, 48.9 and 59.0%, respectively, indicating that the addition of either MI or BC favors TKN content increase. 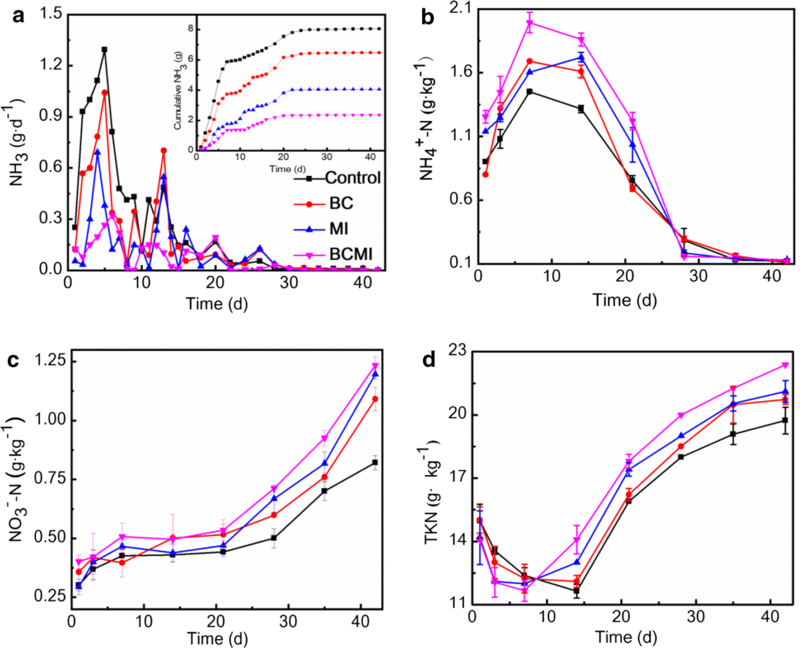 Moreover, in view of nitrogen conservation, BCMI was more effective than BC and MI; the preloading of MI onto BC provides the BCMI with a synergistic effect on nitrogen conservation through increase TKN content during the composting process. The synergistic effect is possibly caused by the fact that biochar was a material more suitable for the propagation and inhabitation of microorganisms, and the preloading of microorganisms onto the porous structured biochar matrix benefits the increase in the microbial population, diversity and activity (Carpenterboggs et al. 1998; Kolton et al. 2016). Thus, the reduction of NH3 volatilization in BCMI treatment was higher than those of the control, BC and MI treatments (Fig. 2a). These results demonstrate that the preloading of MI onto BC provides the BCMI with a synergistic effect on nitrogen conservation through increase of TKN content by reduction of NH3 volatilization during the composting process. Some greenhouse gases such as CH4 and N2O are generated during the composting process due to the sharp degradation of nutrient and organic matter during the thermophilic phase with the demand in oxygen scaring (Yuan et al. 2018). CH4 is emitted from methanogenic bacteria deoxidization of CO2/H or CH3COOH during the composting process (Mao et al. 2018). The variation in CH4 emissions from all treatments is exhibited in Fig. 3a. CH4 emissions sharply increased during the first 3 days and then decreased quickly towards the end of the test period for all treatments. Clearly, the peak values of CH4 emissions were 0.69, 0.39, 0.86 and 1.33 g/day for the control, BC, MI and BCMI treatments, respectively. Among the three treatments, the BC treatment produced the least amounts of CH4 emissions (Fig. 3b). 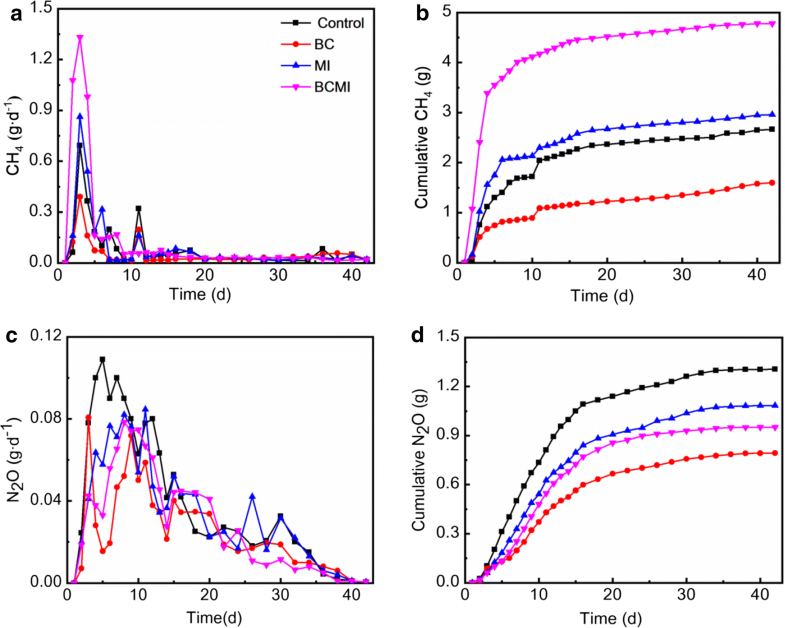 This is likely related to the fact that biochar addition improves the activity of methane-oxidizing bacteria (Liu et al. 2017a) and increases the porosity of the compost pile, thus reducing the density of anaerobic sites (Chen et al. 2017). After 42 days of composting, the two microbial inoculation-added treatments, MI and BCMI, showed higher CH4 emissions than the control and BC treatment (Fig. 3b). Moreover, in this study, no synergistic effect on CH4 emission reduction was observed in the BCMI treatment throughout the composting process. This is probably because the composition of the microbial inoculations used in this study is facultative intricate inoculants with both aerobic and anaerobic microbial communities, which might favor methanogenic bacteria activity. The mechanism of BCMI on organic matter transformation during composting still needs further investigation. In addition to CH4, N2O is also an important composting gas. N2O emissions increased dramatically during the first 5–10 days and then declined irregularly thereafter to a value near zero at the end of the composting period (Fig. 3c). The results were in accordance with prior reports involving the composting of biochar, zeolite and lime-amended sewage sludge (Awasthi et al. 2016a, b); biochar and bacterial consortia-assisted pig manure (Mao et al. 2018); and cattle manure (Hao et al. 2001). Over the course of 42 days of composting, the cumulative N2O emissions were as follows: control (1.31 g) > MI (1.08 g) > BCMI (0.93 g) > BC (0.79 g) (Fig. 3d). The cumulative N2O emissions in the BC treatment were lower than those in the control, MI and BCMI treatments, which was likely due to the improvement of the porosity and promotion of the oxygen supply in the compost mixture following BC addition (Jain et al. 2019), which could induce nitrification and thus favor more nitrate formation (Mao et al. 2018). The RDA results demonstrate the correlation between the environmental aspects (pH, temperature, GI, TKN, OM, NH4+–N and NO3−–N) and the emissions of CH4, NH3 and N2O from the compost samples (Fig. 4). CH4 production was regulated by composting factors, including pH, temperature, oxygen supply and methanogenic bacterial activity (Mao et al. 2018). It was evident that the variation in CH4 in all treatments correlated with the temperature of the compost. Moreover, the temperature had a positive correlation with NH3 volatilization and the degradation of OM. In addition, the GI value had a negative relationship with the production of NH3 and NH4+–N. The RDA results also suggested that NH4+–N had a positive relationship with NH3, while TKN had a positive correlation with NO3−–N but a negative correlation with NH3 emissions. Moreover, the generation of N2O is extremely complicated, as it can be produced in two diverse ways via both incomplete nitrification and denitrification (Sánchez-García et al. 2015). In this study, the N2O emissions decreased with increasing NO3−–N concentration during the composting process. The RDA also confirmed that the trend of NO3−–N had an obvious correlation with N2O release. The RDA showed a significant relationship between CH4, NH3 and N2O volatilization and other physico-chemical properties of the compost samples in the four treatments. The germination index (GI) reflects compost phytotoxicity and maturity (Wang et al. 2017). In typical composting practice, a GI value ≥ 0.8 implies the complete maturity of compost (Tiquia and Tam, 1998). The GI value gained from each treatment presented a trend toward a gradual increase with the progression of composting (Fig. 5). The increase in the GI value during composting possibly resulted from the reduction of ammonia and/or the degradation of toxic low-molecular weight fatty acids (Li et al. 2015). Clearly, the final GI value of all treatments except for the control was > 0.8 within 4 weeks, suggesting that the addition of BC, MI and BCMI helps with compost mixture detoxification. After 42 days of composting, the GI values were 0.95, 1.05, 1.10 and 1.16 in the control, BC, MI and BCMI treatments, respectively, thus indicating that a mature, nonphytotoxic and high-quality final compost product was obtained. Besides, the selected parameters exhibited in Table 2 are some of the important indicators for evaluating the maturity of the compost product and the potential for agricultural utilization. It was found that the final compost products in the three treatments all reached maturity standards, especially with BCMI treatment, indicating a more acceptable fertilizer quality for agriculture. Compared to the BC and MI treatments, the use of biochar/microbial inoculation (BCMI) had great synergistic effects on the enhancement of pig manure composting through benefiting the sanitation of the compost mixture, accelerating the degradation of organic matter, facilitating the NH3 and N2O emissions reduction, promoting the NH4+–N and NO3−–N transformation, and helping the compost mixture detoxification during composting and improving the quality of final compost product as well. 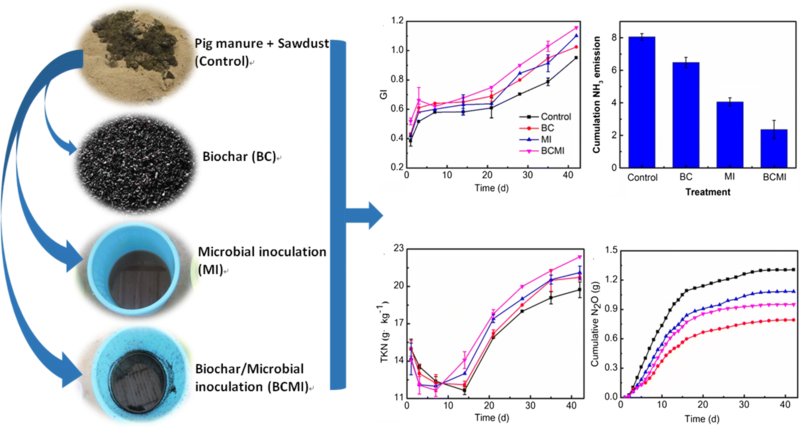 The superior synergistic effect on the enhancement of pig manure composting makes BCMI a possible additive in composting engineering practice. This study comparatively investigated the effect of the use of commercial additives [biochar (BC), microbial inoculation (MI) and biochar/microbial inoculation (BCMI)] on nitrogen conservation, greenhouse gas emissions and quality improvement of pig manure compost. The results showed that the duration of the thermophilic stage, the degradation of organic matter, the detoxification of compost and the content of total Kjeldahl nitrogen were significantly enhanced in the BC, MI and BCMI treatments. Although the addition of MI and BCMI could not reduce the release of CH4 during composting, the two additives, especially BCMI, were more effective in the conservation of compost nitrogen through the reduction in NH3 and N2O volatilization than the control. After 42 days of composting, all the final compost products exhibited acceptable fertilizer potential for use in agriculture, especially the BCMI treatment. Commercial BCMI is a potential compost additive with a synergistic effect on the enhancement of pig manure composting. Funding for this study was provided by the Science and Technology Program of Yangling Demonstration Zone (China) (2017NY-24) and the Key Research and Innovation Plan of Shaanxi Province (2018ZDCXL-NY-02-02).